This entry was posted in bumper repair bumper scrape fix car bumper on April 30, 2010 by admin. 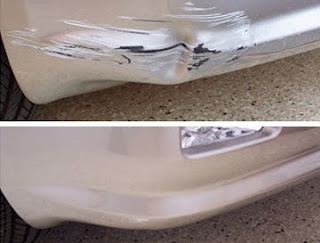 Expert bumper repair saves you time and money. It is an excellent alternative to complete bumper replacement, especially when dealing with expensive replacement parts. By repairing only the damaged area of the bumper the majority of your vehicle’s factory finish is maintained, prolonging the value of your vehicle. Sameday’s skilled technicians use computerized color matching systems to guarantee perfect color match. The damaged area is repainted with high-end European paint and clearcoat. The process is completed with a high-intensity infrared baked-on finish.